Over the last couple of years we have been trading out our lights for smart home lighting. These lights can be programmed to turn on and off throughout the day. It’s funny because some people say, “how lazy are you that you can’t even turn on a light?” It’s not really about being lazy or not…it’s more just about going about your day uninterrupted. It’s kind of amazing the affect that lighting can have on you. Right now it’s 11:50 pm and twenty minutes ago all the lights turned off to tell me that I need to be in bed. And now that my kids are back in school, our light schedule is a big help in getting them up when it’s dark in the morning and settling them down at night. 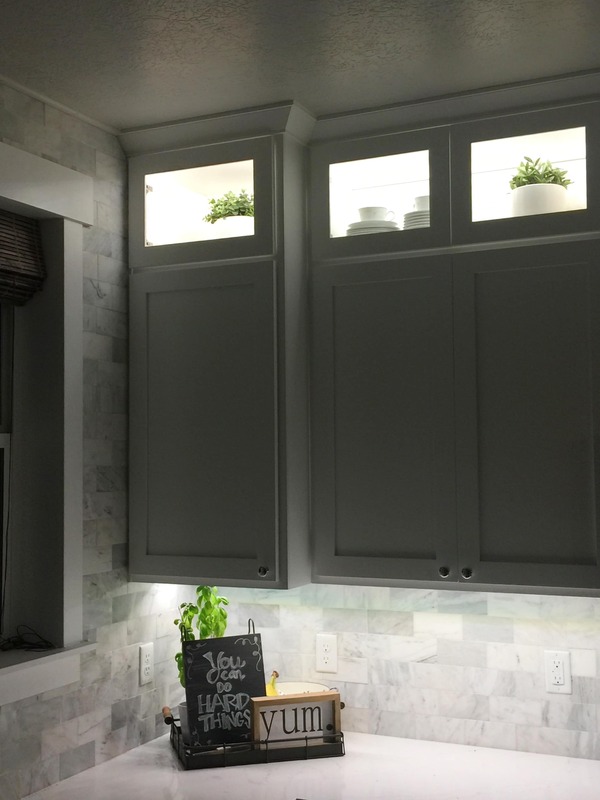 My husband programmed the lights so that within about 15 minutes of sunset the console lamps, built-in lights, and kitchen cabinet lights turn on and the overhead lights turn off. This helps to signal to the kids that it’s time to get ready for bed. And it’s great that he could link it to the sunset time because that way it naturally works with the sun rather than constantly having to re-program it. He also programmed the light setting to go from bright white to soft white. The bright white is energizing but at night we like the soft white which is relaxing and helps us unwind. My favorite time of year with the smart lights is in the later fall and winter, when it gets dark so much earlier. The lights coming on keeps us going right on with our routine and since they are still set to bright white, it helps my kids focus on their homework. They are great for the dark mornings as well, to light the house up and get us going in the morning. 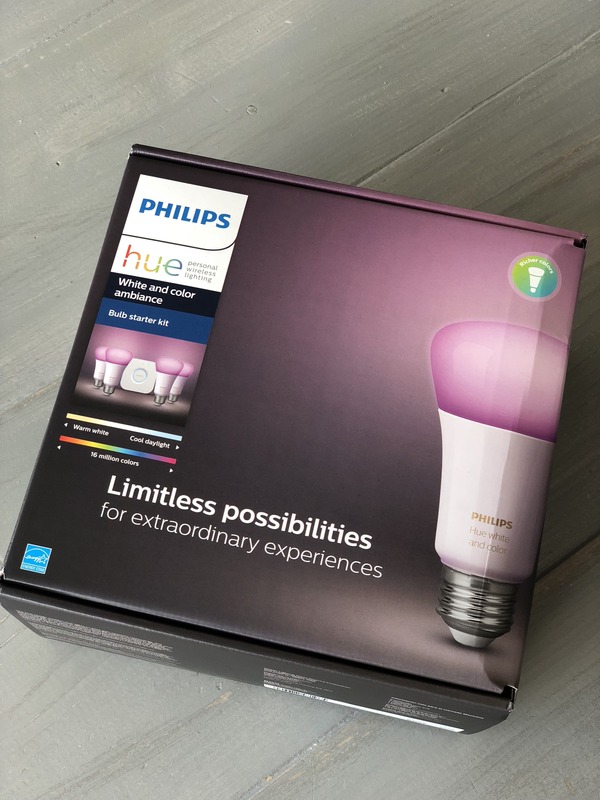 We got started with smart lighting by purchasing the Philips Hue White and Color Ambiance starter kit. These were super easy because you basically just switch out the light bulbs in lamps (or any indoor light fixture.) It also comes with a bridge, which is the heart of the Hue system. It allows for the app-based control of the Hue lights and an Ethernet cable to connect the bridge to your wireless router. We can control our lights with Amazon Echo (Alexa), Google, or Siri. You can change the color, brightness, or just turning it on and off. My husband set up the hub in a discreet but centrally-located spot. Then he just swapped out the light bulbs in our console lamps and our bedroom lamps and programmed them through the app. It was pretty simple. 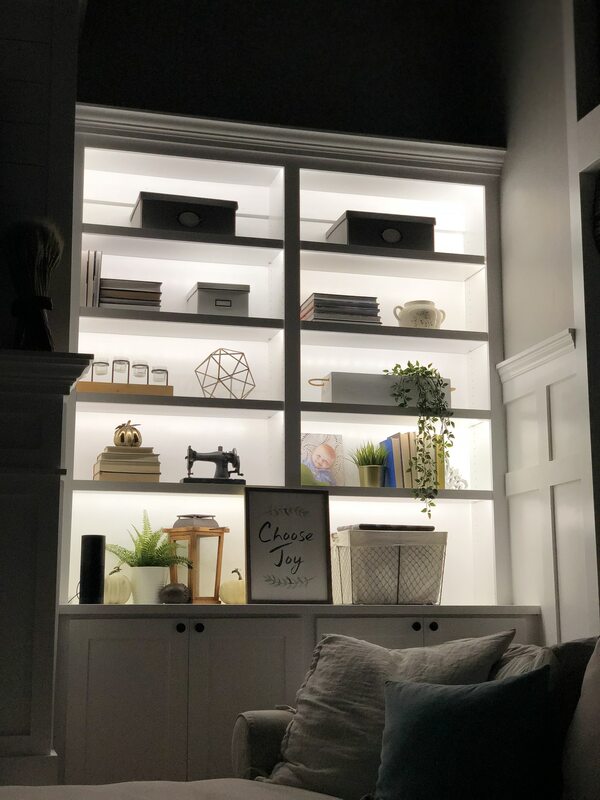 The next set we added was Philips Hue smart light strips in our cabinets and built-ins. This was actually really easy and such an awesome lighting hack. The strip has sticky backing and my husband drilled holes through the cabinet/built-in sides and weaved the strips up and around. 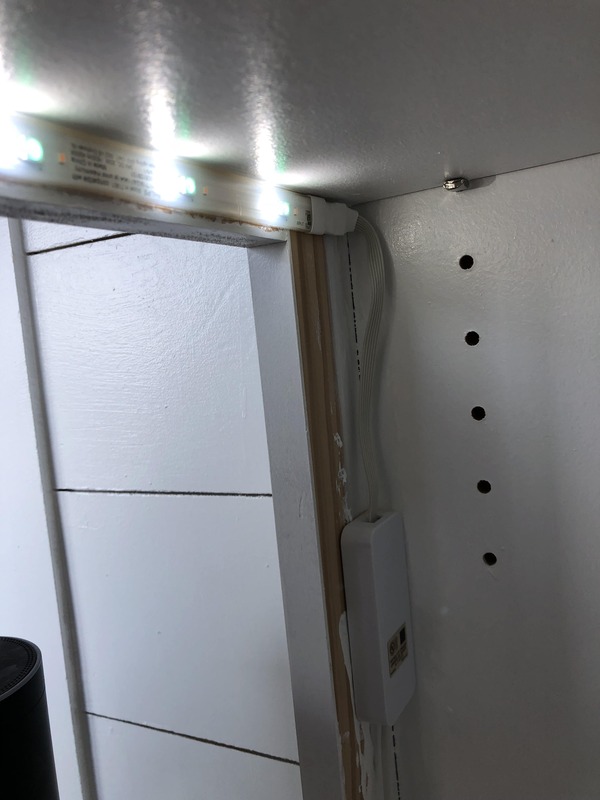 My husband also rewired many of our light switches for smart switches so our ceiling lights also work with the smart hubs. This is definitely more of an advanced project so I won’t discuss it here but basically what it means is that our entire main floor lighting is controlled by smart hubs. Philips smart lighting has made our lives so much more easier than I realized it would. 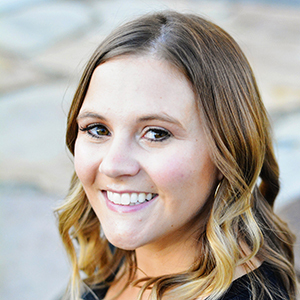 I love how the outside lights turn on and off automatically, how our Christmas light switch can be programmed during the holidays, and simply how our every day routines can be enhanced and programmed to have just the right lighting for our needs. And maybe the best part is not having to get out of a comfortable bed at night to turn off the light! I’m sending it to som palss ans additionally sharing in delicious. him as no one else recognise such special approximately my difficulty.